On January 15, during a town hall meeting at Brock University, Prime Minister Justin Trudeau reaffirmed his condemnation of the Boycott, Divestment, and Sanctions (BDS) movement. The issue was brought up after an audience member asked the Prime Minister to retract his previous statements regarding BDS. In November 2018, during his apology to the Canadian Jewish people for Canada’s refusal to admit Jewish refugees in 1939, Trudeau cited “BDS intimidation” as an example of contemporary anti-Semitism on Canadian campuses. The BDS movement emerged as a call from Palestinians to engage in non-violent, sustainable resistance against the apartheid military state of Israel. Condemning BDS as well as supporting its ban on college campuses blatantly disregards both the Palestinian struggle for liberation and the safety of Palestinian students in Canadian universities. While condemning BDS, Trudeau denounced the movement’s attempt to “delegitimize, and in some cases, demonize” Israel. These statements mischaracterize BDS. The movement calls on states, organizations, and individuals to boycott, divest from, and place sanctions on the Israeli government, in order to not “be complicit in the commission of Israeli crimes.” These actions take the form of military embargoes, commercial and financial penalties, and the cutting of diplomatic ties. Israel illegally occupies Palestinian land and violently oppresses Palestinians. Canada’s refusal to take action against Israel’s blatant human rights violations is rooted in a pro-Zionist and geopolitical agenda. Hypocritically, Canada currently enforces economic sanctions against 20 different countries, including five in the Middle East. These sanctions include measures such as trade restrictions, freezing of foreign officials’ assets, and arms embargoes. Canada only targets states that are not politically allied with the West. Claiming that Israeli students will be targeted if SSMU expresses opposition to the Israeli government’s actions and policies is flawed and misguided. The people of a country cannot, and should not, be conflated with the country’s government. SSMU has in fact divested from companies who profited off of human rights violations in the Congo. Similarly, supporting BDS will condemn the Israeli occupation of Palestinian land. The issue is perceived differently due to the aggressive anti-BDS stance taken by the Canadian government and the McGill administration, both of which continue to capitalize politically and economically on this illegal occupation. The BDS movement is one of the only student issues the McGill administration has decided to comment on. Principal Suzanne Fortier echoed Trudeau’s mischaracterizations, claiming that BDS “flies in the face of the tolerance and respect we cherish as values fundamental to a university.” These comments came directly after donors threatened to reconsider funding due to support for BDS on campus. The administration’s complicity in the occupation of Palestine continues to marginalize and delegitimize the lives of Palestinian students. Principal Fortier seems to be more concerned with pleasing donors than protecting students. What actually “flies in the face of tolerance and respect” is the government and administration continuing to support and profit off of a violent occupation that threatens the lives of Palestinians every day. As McGill students, we have a responsibility to support BDS and must work towards bringing the movement back on campus. A member of McGill Students in Solidarity for Palestinian Human Rights (SPHR) states that the best ways for the McGill administration to implement BDS demands are by “cutting off ties with [Israeli] universities which engage in military weapons research [and] divesting from corporations that are complicit in the continuous occupation of Palestinian land and life.” They also add that as students, “the best way we can fight [the occupation] is by […] listening to Palestinians, [and] learning from them,” as well as attending SPHR and IJV events and workshops on campus. 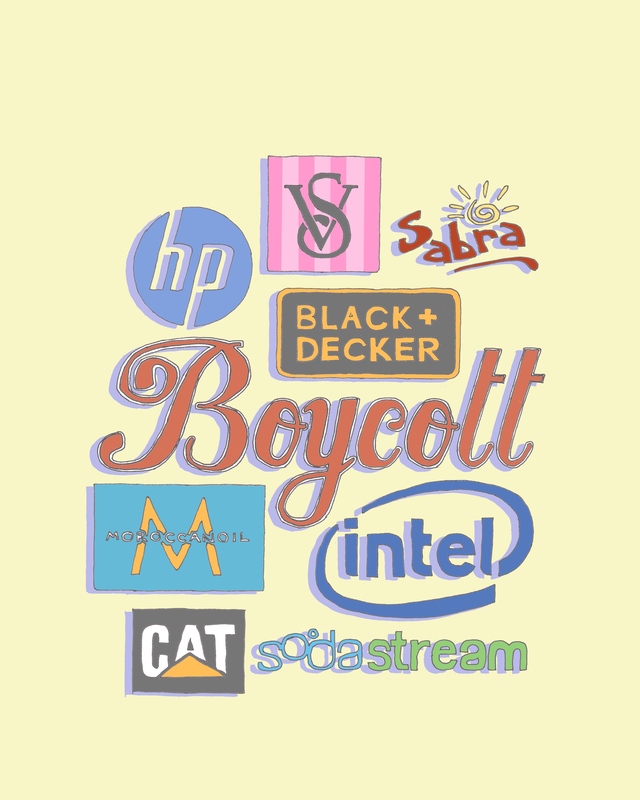 Supporting BDS also means engaging in the economic boycott on a personal level. The full list of companies which contribute to the occupation of Palestine can be found here: bdslist.org/full-list/.